We make any sizes by the order! Pictures are for reference only. The brand new one has paper attached to the acrylic and needs to be peeled out. Acrylic part goes together easily with the side laser cut hooks. Overall size: 25"L x 15"W x 21-3/16H. Wooden frame size: 25" x 15" (Walnut Stained Cap). Inside: 23"L x 13" x 20. Assembly time: less than one minute. Some pictures are not related to this listing size, they are just showing assembling process. This display case is the best way to protect your model. 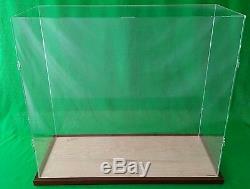 The item "23 x 13 x 20 Table Top Display Case Box for Doll Houses Dolls Bears Dollhouses" is in sale since Friday, January 9, 2015. This item is in the category "Dolls & Bears\Dollhouse Miniatures\Doll Houses". The seller is "acrylicjob" and is located in Glendale, California. This item can be shipped worldwide.